For some — hi, Mom! — Boston Cream Pie may be their favorite kind of pie. I tend to feel the same way. What’s not to love about sponge cake plus custard all topped with a nice layer of ganache? For this native New Englander, anything beside those three elements is just blasphemous — I’ve seen more buttercream-topped “Boston Cream Pies” at bakeries in Northern California than I care to remember. What I can get behind, though, is changing how the pieces of the pie fit together. I love(d) the idea of a multilayer version — four cake layers, two custard and one ganache — but dreaded cutting into it. Wobble wobble wobble. So a personal-size rendition where any treacherous sawing could be avoided sounded like the next best thing. It was time to dust off the ol’ cupcake corer. The result: an ideal ratio of cake to filling to chocolate topping. All in a cute, portable package, making them absolutely perfect to take along on a late-summer picnic! In a small, heatproof bowl (2-quart), whisk together egg yolks and cornstarch; set aside. In a small, non-aluminum saucepan over medium heat combine milk, vanilla sugar and salt. Whisk constantly until the milk is steaming, and just about ready to simmer. Remove custard from heat, strain through a fine mesh sieve into a clean bowl. Whisk in butter. Place bowl in an ice bath and whisk to cool it down quickly. Place a sheet of plastic wrap directly on top of cream, cover bowl with another sheet and refrigerate for at least 1 hour. In a medium bowl (4-quart) whisk together dry ingredients (sugar through salt); set aside. In a small bowl or spouted measuring cup, whisk together wet ingredients (canola oil through vanilla extract); set aside. Whisk together tablespoon of sugar and cream of tartar in a small dish; set aside. Place egg whites in a small bowl (or bowl of a stand mixer), whisk until very frothy then sprinkle in sugar mixture. Whisk egg whites until they hold stiff peaks. Place tin in preheated oven and bake for 30 minutes or until lightly browned on top and cooked through. Allow cupcakes to cool for 15 minutes in the tin before removing to a cooling rack. Cool for another 15 minutes or so before removing cores with a cupcake corer. Snack on or discard the cores. Transfer cooled custard to a pastry bag fitted with a round pastry tip (Wilton #12). Pipe filling into cupcake cores until just above the top of the cake. Use an offset spatula (or knife) to level filling, wipe away excess with a clean finger or paper towel. 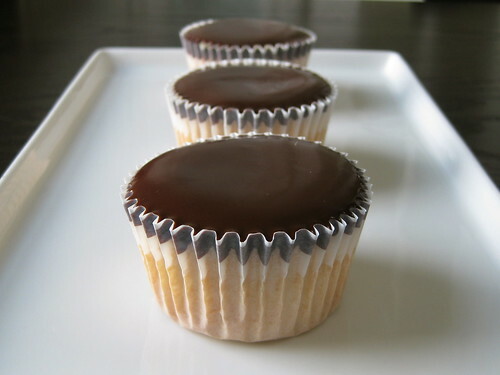 Transfer filled cupcakes to the fridge — uncovered — to set for 30 minutes – 1 hour before topping with ganache. In a small saucepan (2-quart) over medium heat bring heavy cream to a simmer (swirl pan occasionally). While cream heats, place chocolate in a small, heatproof bowl. Pour hot cream over chocolate and let it sit for a minute; gently stir until the chocolate is melted and the mixture is smooth. Remove cupcakes from fridge and spoon about 1 1/2 – 2 teaspoons of ganache over each cupcake. Nudge ganache just barely to the edges using the back of a measuring spoon or small spatula (straight or offset, whichever you prefer). Once all are topped transfer to the fridge to set for at least 30 minutes before serving. ¹ You can find my recipe for vanilla sugar here. Instead of vanilla sugar, you may substitue 1/2 cup evaporated cane juice or granulated white sugar PLUS the scraped seeds from 1/4 of a vanilla bean. ² I occasionally substitute up to half (1.5 ounces or 43 grams) of the bittersweet chocolate with milk chocolate for a less intense ganache.